The exploration for oil in the Arctic Ocean continues full steam ahead, but there are immense risks to the environment and ecosystems. Demand for oil continues to surge and companies are taking more and more risks. Companies will continue to drill for oil in remote areas, such as the Arctic region, and there are clear and present dangers. That said, by investing in the best available technology (BAT) and solutions coupled with training and preparedness, offshore oil exploration and drilling can be conducted in a more responsible and safe manner. This is where the expertise of Lamor steps into the scene. Lamor’s knowledge, expertise and commitment in providing the most advanced oil spill clean-up solutions with equipment, training, and a response team known as the Lamor Response Team (LRT), is unparalleled with a global reach in any climatic conditions and regions. “Lamor’s dedication to tackle some of the most environmentally human-caused destructive and hazardous elements such as oil spills is what we do, and I can say that oil clean-up operations is what we are fully dedicated in doing,” says Fred Larsen, CEO of Lamor Corporation. The Arctic Ocean’s ecosystem is the most vulnerable to oil spills in comparison to other regions. “Cold weather, the thick ice cover together with slow turnover of plants and animal life mean that toxic oil spills could last longer and expose multiple generations of organisms to contamination,” says Larsen. “The lack of sunlight also impacts the breakdown of spilled oil and other chemicals. Thus, it is essential for both governments and corporations to be responsible and invest in safeguards, training , and equipment, in order to quickly and efficiently take the appropriate steps to reduce a catastrophic environmental disaster,” he says emphatically. The U.S. Bureau of Ocean Energy Management Regulation and Enforcement (BOEMRE), estimates that the Arctic Ocean holds up to 19 billion barrels of oil and up to 74 trillion cubic feet of natural gas. For the global energy market this is significant since such vast resources amounts to approx. 25% (or more) of the world’s undiscovered oil and gas resources. Territorial disputes surface between nations that border the Arctic Ocean i.e. Canada, Greenland, Iceland, Norway, Russia and the US. Having the right partner in oil spill prevention and preparedness is vital. Lamor’s product portfolio comprises the patented oleophilic brush skimmer systems, oil containment booms, oil transfer pumps and workboats as the main categories. “We rely on Bureau Veritas to certify all our equipment in accordance with international standards. We have also adopted Ohmsett’s test program and facilities as part of our new commissioning for our new technological innovations and solutions for oil spill recovery and clean-up operations. That said, we do more at Lamor; we truly subject our equipment to very harsh and challenging conditions to ascertain their effectiveness and efficiency,” says Larsen confidently with a smile. Lamor’s equipment has been deployed and their capability proven by continuous testing in the harsh winter conditions simulated in Siberia. From the outset in the 1980s Lamor, together with The Finnish Environment Institute (SYKE – a government agency), developed equipment to perform in the extremes of the Northern Hemisphere winter and this has resulted in the development of a robust and dependable equipment portfolio. “We work in close cooperation with SYKE in developing new technologies or Arctic oil response and recovery, for example the Lamor Oil Recovery Bucket Skimmers,” says Larsen. Lamor’s Arctic product range comprises the Lamor Arctic Skimmer, Ice Bow Collector, Lamor Oil Ice Separator and the Lamor Oil Recovery Bucket Skimmer, which all come in various sizes depending on the customer’s requirements. The Oil Ice Separator and the Oil Recovery Bucket differ somewhat from Lamor’s standard brush wheel or conveyor belt type skimmers. 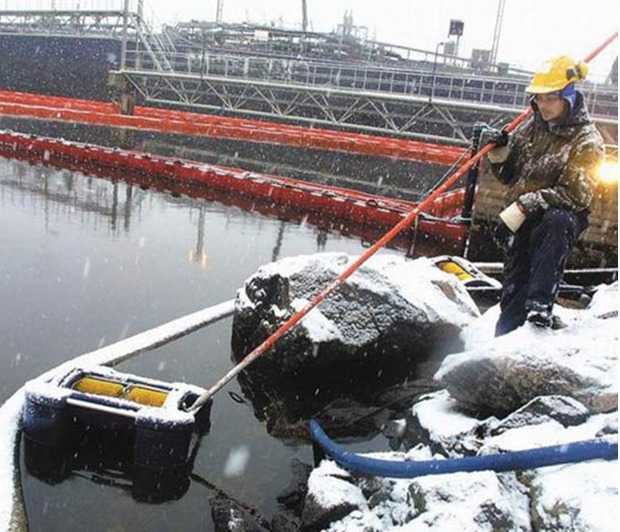 “Our Oil Ice Separator is an ice vibrating unit and the Oil Recovery Bucket in that it is deployed using a crane, thus combining the efficient cleaning of the Lamor Brush Wheel skimmer with the powerful surface cleaning and digging function of an excavator scoop, enhanced by the proven pumping performance of a positive displacement Lamor GT A Archimedes screw type pump,” says Larsen. 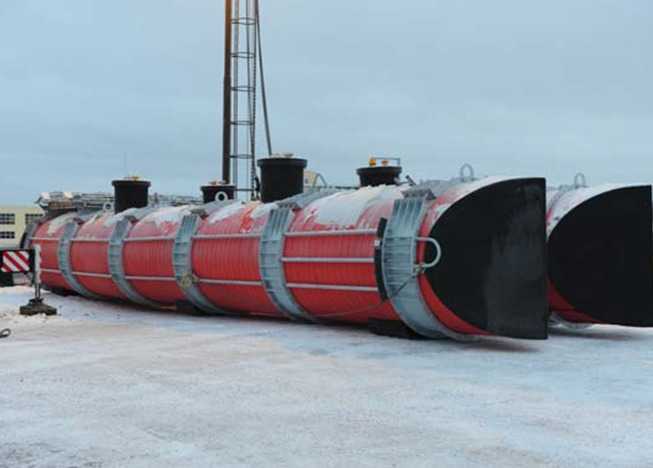 The Lamor Oil Recovery Bucket LRB 150 – 300 has proven its efficiency in many spills, e.g., in the Gulf of Finland, off the coast of Estonia in icy winter conditions in 2006, and it has been thoroughly tested in Arctic conditions. The Foundation for Scientific and Industrial Research at the Norwegian Institute of Technology (SINTEF) test reports from Trondheim in 2007 and Svalbard in 2008 show that the Lamor Oil Recovery Bucket has excellent ice handling and no free water content in recovered oil. Lamor has carried out thorough tests together with the Finnish governmental organizations in the Gulf of Finland and the Gulf of Bothnia during harsh winter conditions in order to maximize efficiency, durability and dependability in the oil recovery equipment. On February 17, 2011 the 17,000-dwt Icelandic container ship M/S Godafoss, en route to Denmark, grounded off the southern coast of Norway threatening the Ytre Hvaler National Park, and the western Swedish coast line. The ship was carrying approx. 800 tons heavy fuel oil and approx. 440 containers onboard. During the recent Godafoss oil spill off the coast of Norway, the Norwegian Coast Guard coupled with the Swedish Coast Guard were alerted. The Swedes deployed the KBV vessels KBV 050, KBV 051 and KBV 001 Poseidon to the scene. Those specific vessels are equipped with built-in Lamor Oil Recovery Systems (LORS). During the oil recovery collection, one of the challenges was the freezing temperature which solidified the oil immediately. However, this obstacle was overcome due to the heated brush cleaner on the Lamor skimmers coupled with precautionary heating set-up from skimmer to collection tanks. Lamor has developed a new skimmer type that meets the requirements and has all the necessary features for efficient and successful oil recovery in icy conditions. This new Multipurpose Brush Skimmer works as a free floating skimmer in “normal” response operations at sea, but by uncoupling the float unit and connecting the skimmer head to a wire or crane, the skimmer can be used to collect oil in icy offshore conditions. No ice processing is needed. The design is robust, and has an antifreeze design, e.g., the brush wheels are covered and protected, there is a double heated pump hopper for the GT A pumps that have annular hot water injection and hot water lubrication, and the oil transfer hoses are also heated. The skimmer is equipped with double acting scrapers facilitating use in different types of oil. 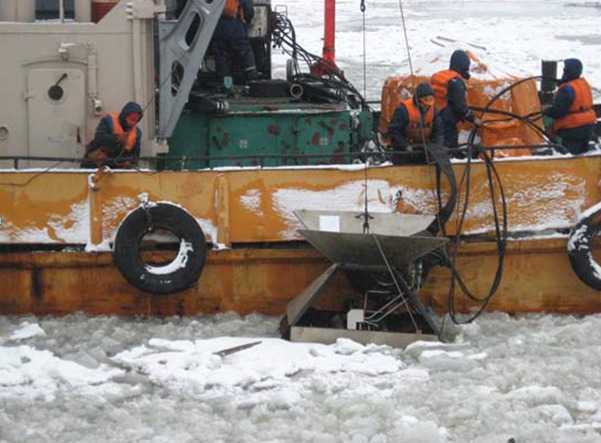 “The key to successful Arctic oil spill recovery and clean-up operations are: the advancing system, independent multipurpose vessels with excellent maneuverability, Lamor’s skimmer to collect the heavy oil in icy conditions, and our heating arrangement from skimmer to tank operated by a skilled and well trained crew,” Larsen reveals. “Each spill presents a different set of circumstances that must be considered as part of the response, and different circumstances require different response actions. It is much easier to prevent spills than to respond and clean them up…its teamwork,” concludes Larsen.